Today I am making Babka again for our Christmas guests and some people are sad that it isn’t ready yet. Fortunately Dave is making eggs to order. We are so lucky! This entry was posted in food and tagged breakfast, granola on December 22, 2017 by metamegan. I started following Smitten Kitchen on Instagram lately, and I have been making a lot of her recipes as a result. I think I was initially drawn to this one because it looked like chocolate in the middle. I was wrong. It’s filled with dates. I made it anyway. If I had to predict, I would have said Luke wouldn’t like it and Jack would love it. Mostly based on the fact that Luke is slightly less into oats, and Jack would eat raw oats for every meal if I hadn’t recently read that raw oats aren’t that great for your *digestion*. I was wrong about that too, Luke had seconds and Jack didn’t even finish his. For once in my lifetime, I was making a recipe that called for an 8X8 pan, which is the size I have. (And the reason so many of my other 9×9 and 10×10 breakfast recipes can be challenging.) So I’m not sure why I didn’t have nearly enough oat mixture to make a top and bottom layer. I did the thinnest layer possible on the bottom and then added the date layer. Then I added a giant handful of oats to the remaining oat mixture, and then I had just enough to cover the dates. So I would definitely add more oats if I were to make this again. I probably won’t make it, because the leftovers were too crumbly to take in a snowboarding pocket, and I think they have just been languishing in the fridge. Of course, I did also make a giant cake this week so maybe no one was desperate for a healthy dessert item when there was cake to be had. I served the date bars with bacon and the whatever the kids wanted on the side. Luke had an egg and Jack had… oatmeal. This entry was posted in food and tagged breakfast, date, granola on March 3, 2017 by metamegan. Last weeks FBF was a bit rushed because I had to hurry the kids out the door to school, drop off the dog, and head to the airport for a getaway weekend with the hubby. We went to a dear friend’s wedding party in NYC. We’ve never left the kids or been to NYC so I was a little stressed. I prepared by doing nothing and planning to wing it. It worked out! Fancy Breakfast Friday consisted of yogurt parfaits – blueberry/yogurt/homemade granola repeat with bananas then strawberries. I am working on perfecting my granola recipe so I will share that at a later date. It’s weird to me that the markup on store bought granola is 700,000% so I should do a cost analysis along with my recipe to see if I am missing something. Our favorite yogurt is brown cow vanilla cream top. 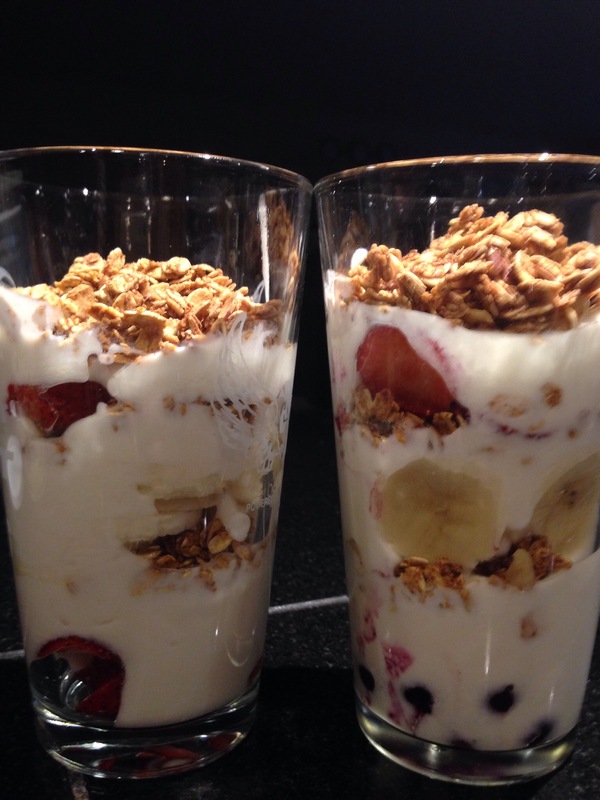 This entry was posted in food and tagged breakfast, granola, parfait, yogurt on September 25, 2015 by metamegan.